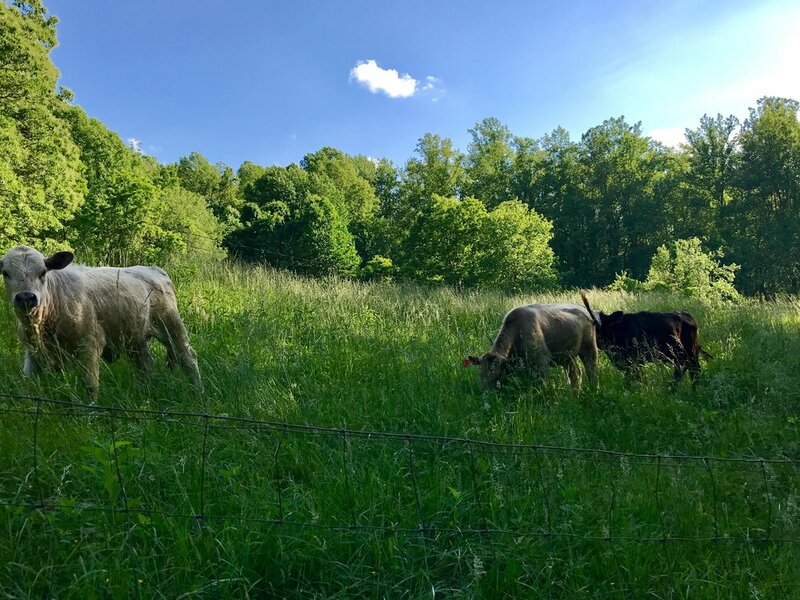 Nestled in the beautiful Blue Ridge Mountains, this bed & breakfast, farm, and retreat center is the place to relax, unwind, get in touch with nature and focus on inner bliss. Enjoy a peaceful atmosphere where you can clear your mind of all the chaos that daily life can bring and focus on inner peace and reconstitution. Bliss Farm offers unparalleled privacy, mountain views, walking trails, meditation sites and so much more. During your stay, you can feed and spend time with farm animals, eat local, natural and organic foods produced right here on our farm. At Bliss Farm, the goal is to provide an environment for you to focus on your health and wellbeing in every aspect, physically, mentally and emotionally. This sets an atmosphere that allows you to truly rejuvenate yourself, find clarity and set you intention. All while being a short drive to Asheville to indulge in all of the amazing activities the Asheville area has to offer. 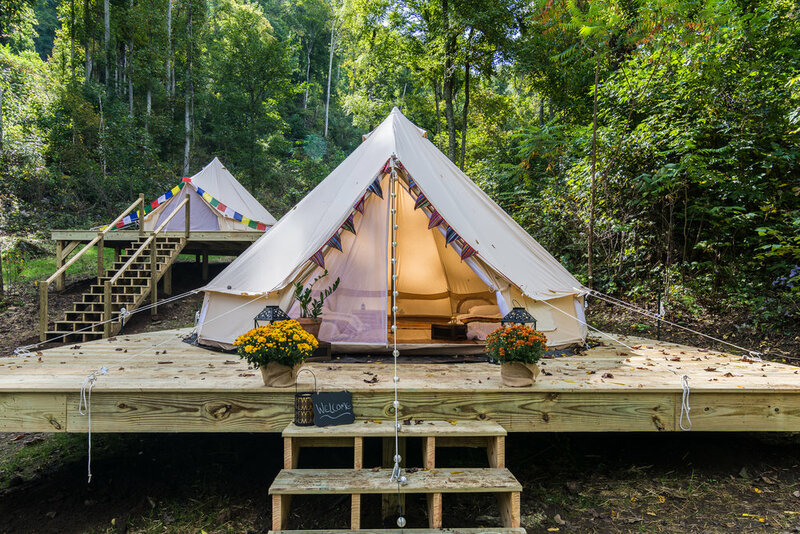 Join Christine Lentz & Kelsey Harrison on a 4-day, 3-night yoga and hiking retreat that has been mindfully created to reconnect you with nature and yourself. Each queen bed pricing for two people is the FULL price for the bed and is to be split. EX: Queen bed is $1000 for two people, therefore it is $500 a person. This private room with in-suite bath is loved by many and allows for the ultimate zen experience. Located in the Bliss Farmhouse and looking over Bliss gardens this room is spacious, private, with a queen bed draped in plush bedding and is the perfect place to find your bliss. Mrs. Kay’s suite is the biggest room in the Bliss Farmhouse and by far the most chicly appointed. The suite includes a spacious sitting area and queen bed with pasture and mountain views. This room shares a bathroom with the World Traveler Room. BOOKED: Queen Bed – $880 for one or $1080 for two people. 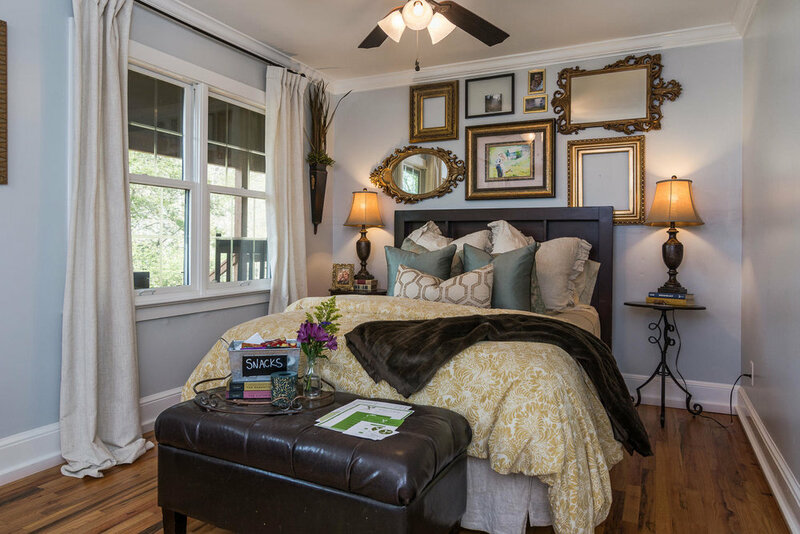 This private bedroom features a twin bed and is decorated with memories from world travels. The World traveler is perfect for the solo traveler who loves boho style. Situated in the Bliss Farmhouse this private room shares a bathroom with Mrs. Kay’s Suite. The Osa is surrounded by the woods, has fresh spring water, and a beautiful porch to enjoy all nature has to offer. Enjoy all of this, along with a fire pit, coffee maker, refrigerator, and the Bliss Snack Bar. BOOKED - Queen bed – $830 for one person or $1030 for two people. The Bali Bliss is a representation of everything to love in this world. Enjoy this adorable cabin tucked in the woods, with an beautiful front porch, a fire pit, coffee maker, refrigerator, and the Bliss Snack Bar. This cabin has two twin beds and a queen bed in the loft, and a queen bed on the first floor. BOOKED: Queen Bed — upstairs – $725 for one person or $925 for two people. BOOKED: Queen Bed — downstairs – $830 for one person or $1030 for two people. These gems are filled with plush bedding and fun decor. Rustic chic accommodations for the budget traveler. 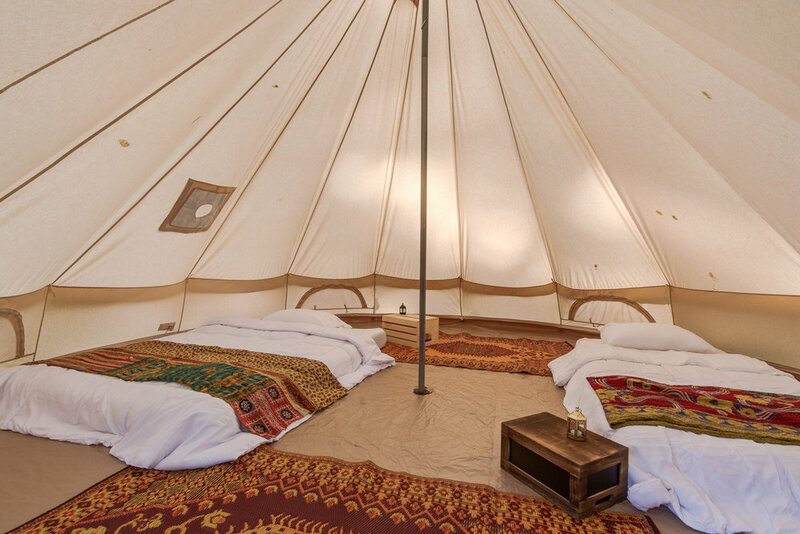 Bell Tent #3: BOOKED: 2 Queen Beds – $590 for one person or $800 for two people. Send me a message if you would like to be put on the waitlist.